The Alsation mathematician and naturalist Johann Heinrich Lambert (1728-1777) is renowned amongst physicists as the founder of the theory of light measurement, which at that time was known as «photometria». In about 1760, Lambert originated the law governing the illumination of a surface by a light source which still bears his name. He also studied the ability of surfaces to reflect, and their transparency. His Cosmological Letters, written as a member of the Academy of Frederick the Great in Berlin, are famous amongst astronomers. Lambert attempted to explain the structure of the universe in these writings — at that time it was not known just how extensive our galaxy, the milky way, actually is. In the course of his deliberations, he consulted measurements taken by Tobias Mayer in Göttingen, and thus became aware of Mayer’s colour-triangle dating from 1758, the publication of which he was to subsequently support. 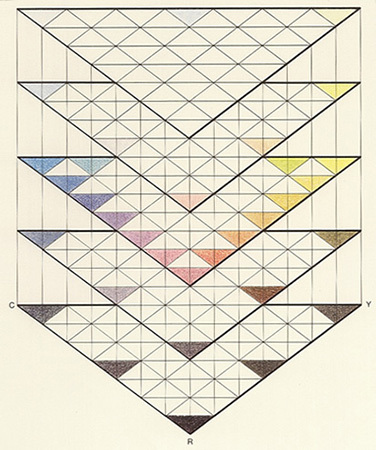 Lambert recognised that Mayer had discovered a means of constructing and naming many of the possible colours, and at the same time also recognised that, to extend its coverage to include their full abundance, the only element missing from this triangle was depth. 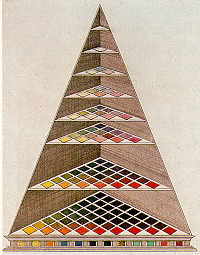 After carrying out his own experiments, Lambert suggested a pyramid constructed from a series of triangles (historical illustration) to accommodate the full richness of natural colours in one geometrical form. These differ from Mayer’s triangles not only in their size, but also in the position of black. As with Mayer’s model, the corners of Lambert’s base triangle are occupied by King’s yellow, cinnabar (shown here as Y for yellow and R for red) and azurite. In each case, two basic colours are mixed (with varying proportions) to form seven hues along the sides, while on the inside all three basic colours contribute to the colour of each respective surface unit. A total of 45 colour-hues are thus formed in the lowest triangle, above which the others rise, tapering and becoming brighter as they proceed upwards. In turn, they contain 28, 15, 10, 6, 3 and finally 1 field. 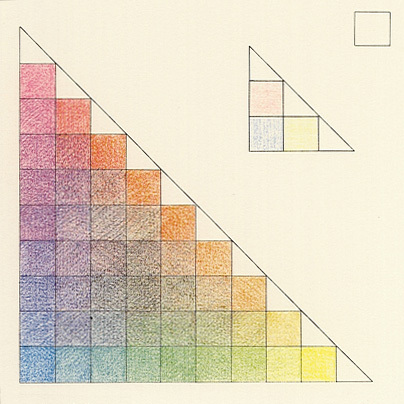 Lambert accommodates a total of 108 colours or their mixtures in his pyramid, the tip of which is white. This construction succeeds in incorporating the various «tertiary colours» into one system, and logically links them with the neutral grey values appearing along its central axis. The colour created by mixing all basic colours — black — is found at the centre of the lowest triangle. More colours can be distinguished on this plane than at the point where white predominates, demonstrating that the system of colours must taper upwards, and is a therefore a pyramid. Lambert believed that textile merchants, after consulting his system, would know if they stocked all the colours, and if there were gaps in their range. He also hoped that the dyers and printers of his time would find inspiration for their mixtures. 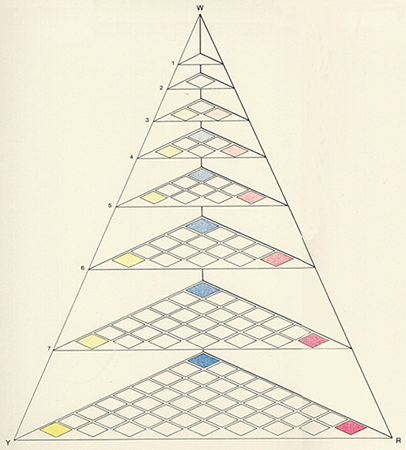 As a naturalist, Lambert used his pyramid in his efforts to identify and classify all the colours which occur in animals and plants. Of course, this objective can only be achieved if a mixing system, operating with the three colours yellow, red and blue, is capable of creating each colour. Unfortunately, this is not possible. In nature, there are many tints of very colourful green, orange or violet which cannot be created by subtractive mixing of three primary colours. Many colours in a butterfly, for example, are formed not by a mixture of this kind or specific dyes, but through the physical properties of light: interference, in other words, through thin leaf-like structures. The abundance of colours thus created reaches far beyond the pyramid in which Lambert wished to confine them. Date: The astronomer J. Heinrich Lambert, strongly influenced by the work of Tobias Mayer, presented the first three-dimensional colour-system in 1772. Bibliography: J. H. Lambert, «Beschreibung einer mit dem Calaunischen Wachse ausgemalten Farbenpyramide», Berlin 1772; H. Matile, «Die Farbenlehre Philipp Otto Runges», 2nd edition, Munich 1979; W. Spillmann, «Color Systems», in H. Linton, Color Consulting, New York 1992, pp. 169 – 183.